Keeping track of things in life can be a hassle, particularly your cars statistics, expenses, and anything related to repairs (if you are not into car modding anyways). Our Android devices seem to be here to solve all of these issues with a bit of help from people like XDA member Fasst2001. The dev has created an app called DriverDairy, which as its name suggests, will allow you to keep track on everything that is related to your car. 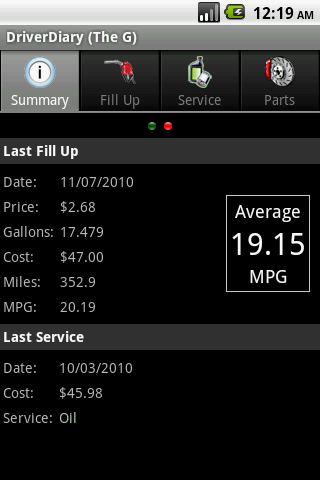 You can record things such as fueling, maintenance, and repair logs, save part numbers for things that you may buy for your car (oil filters, spark plugs, etc), add as many cars as you want to keep track of all of them, export data into .csv format (interesting as you can use Excel to plot consumption if needed), and much more. The app is also not bound by any measurement standards, so you can use different types of currency and measurement systems (SI, English, etc). The app can be found on the market and as usual, please leave any feedback that you may have about this. It’s called DriverDiary and it tracks fuel mileage, expenses and parts. It is a mobile version of the desktop app (which is currently not available and getting a completely new redesign to fit in with the new mobile app). The free version offers many features and is not limited like most other free vehicle tracking apps. It is ad supported and it does lack a couple features from the pro version, but is otherwise fully functional. An update will be released in the next day or two adding charts to the feature list.